Hello fellow gamers, nerds, and the other type of people who may be for some reason looking at this blog post. We all have those games that are so close to our hearts that sometimes they may cloud our judgement as too if it was even a good game. I have decided to make a list of my top games for that very subject. Like I said the games shown may be, what some would say, not good. Lets get started shall we! Now this first game holds a very special place in my heart for one reason, and that is because, at least from what I remember, this was the very first video game I ever played. 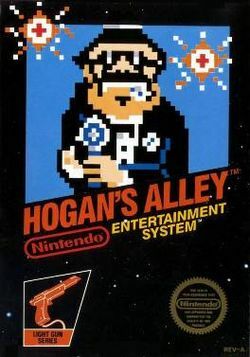 Luckily enough for my little 5 year old brain this game was played using the light gun, which in turn meant I didn't have to wrap my head around the little buttons of a controller and could simply point the cool looking gun at the screen and shoot the pixelated dude who looks like he would not be passing out pamphlets in my neighborhood or school. Looking back this game didn't have much to it, but as a child all you really need is a fake gun too shoot fake dudes with. It would be hard for me to find a person who didn't at least play one wrestling game as a kid. My first experience with the Wrestling video game genre was WWF War Zone. The thing I remember most about this game how funny I thought it was that instead of getting the various weapons from under the ring, you know, like a wrestling game, you got them from the audience. And no you didn't go up and grab them, the audience would literally throw things such as TV's, bells, crutches, etc. into the ring as if they had all just came from some kind of insane wrestling weapon liquidation sale. Needless to say this game provided hours of fun too me and my brothers. Wasn't the best, but its what we had. Probably the best game on the list so far, Twisted Metal 3 was one of my first experiences with a game that wasn't the colorful, happy, platforming games I loved so much on my Nintendo consoles. Now I will admit that I never actually owned this game, but I played a hell of a lot of it at my friends house. I think the best part of it all was that it was the type of game my friend and I had too stay up late to play because of his parents not knowing some (all) of the content in the game. Our experiences would be cut short when his mom walked in on us as we were listening to one of the many character bio's. Damn you Mrs. Kennedy. The reason that the sequel to Banjo-Kazooie is on here and not the first game itself if for the simple reason that I just never played the first one. When you a young child I like to think that numbering doesn't mean anything. Anyway I remember this game was quite the nightmarish experience for me. This was because it is the first time I ever played a game where one of the cute NPC's, in this case a mole that lived with you, was murdered in cold blood, right before my poor child eyes. Now yes the character did come back as a ghost, but at the time I just couldn't believe that Nintendo would let a game have a character blow up. Sadly I did not beat this game for the concept of collecting puzzle pieces apparently was just to much for me at the time. 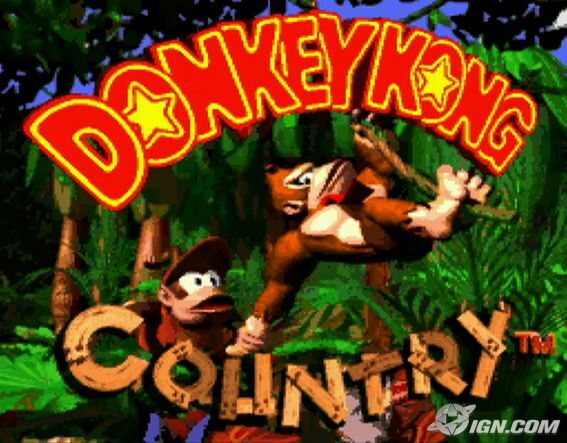 Donkey Kong Country to me was the first time I remember as a kid being blown away by what I was looking at. I felt like I was playing as a real life Donkey Kong because of the graphics that Rare had put into this game. It was something I had never seen before, creating a game that looked 3D and yet I was only going left and right. One level that stands out in particular to me was Stop N' Go Cavern. I remember the sheer horror the invincible creatures of that level induced into me. And the relief when I finally got past it. I also didn't finish this game and if you aren't noticing the pattern I was not very good at video games in my youth. Despite that I still had a lot of fun with this game in the day and too this day still enjoy going back to it every now and then. And now the moment I hope you all have been waiting for, my number one game… Based completely off nostalgia. To me this game is the obvious choice for number one. This was not only the first game I ever truly got addicted to, but it also change my outlook on video games and what they should. After playing this game I promised myself I wasn't ever buying any game that didn't meet Super Mario's 64 standards. Obviously that standard has all but disappeared but the impact this game left on it me still holds to this day. From the very beginning you can see the scope that Nintendo was trying to give this game as almost the very first thing you see in this game is Princess Peach's giant castle. And also, who didn't spend hours just outside of the castle climbing tree's and being horrified when you accidentally drown Mario in the castle's mote because you had no idea drowning Mario was a thing. I thought the castle was the perfect hub area too connect you to the many "worlds" throughout the game, my favorite always being the Bob-omb battlefield. It may not have been as impactful as the 2D Mario games but in my life, and I'm sure many others, it was truly one of the greatest gaming experiences. This didn't make the list, despite being a great game, for one reason, as a child I absolutely hated it. I didn't hate it because it was bad, but because I just could not come anywhere close to making progress. My first playthroughs went like this, Wander around the town talking to people and moon kills everyone. Wander around town, go outside the town and never going back out because of the floating skulls, moon kills everyone. This time wandering around town, learn the song of time, and make some progress inside the Deku Palace, forget how to use the song of time, then moon kills everyone. Needless to say as I kid it was way to much for me to take and I just wanted to play. I do plan on replaying though and give it the time it deserves.